David Dimbleby picked a member of the BBC Question Time audience to speak, and what came out of the young man's mouth sounded suspiciously like a poorly drafted Tory party press release about what a great job Theresa May is doing under difficult circumstances. The reason this impassioned plea for the country to get behind Theresa May's Brexit plans sounded more like a Tory party statement than the thoughts of a random member of the public is that the guy who was invited to speak was Alexander Maughan, a Tory party councillor from Lincolnshire. This is far from the first time a serving Tory politician has masqueraded as an ordinary member of the public to spread pro-Tory propaganda on Question Time. There was the Tory Councillor Eric Holfield who spewed anti-Labour scare stories shortly before the General Election in 2017, and just a few episodes ago there was Christian Stevens, a UKIP-turned-Tory councillor from Horley who desperately tried to whitewash the Tories appalling track record of mistreating disabled people. On none of these occasions did the Tory plant identify themselves as a Conservative politician rather than the random member of the public they were posing as. Once would be an embarrassment for the BBC, but these deceptions just keep on happening. 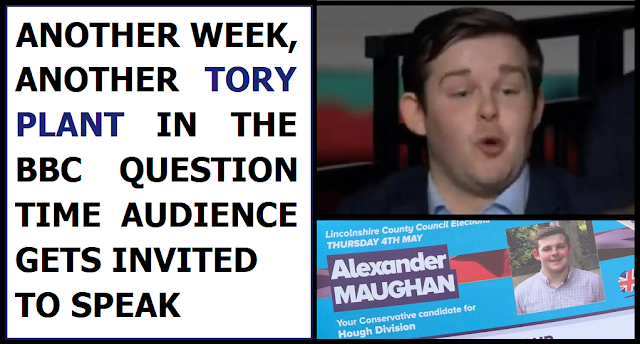 Question Time is right-wing biased enough already without this effort to infest the audience with pro-Tory plants. The show almost always consists of four neoliberal pro-austerity panellists lining up against a solitary progressive voice, and to make matters worse the host David Dimbleby has an appalling habit of repeatedly interrupting non-Tories, and allowing right-wing panel members to interrupt too. The BBC make such a big deal out of their supposed neutrality, but they're completely unwilling to provide a fair balance between purveyors of pro-austerity dogma and pro-investment voices in their political coverage, and that's highly unlikely to change any time soon. However they really do have to get a grip on the Tory plant problem, and make sure that every audience member who is invited to speak on the show is vetted beforehand to ensure that they're not political plants.